Wash and chop the greens. Chop onion and tomato finely. Slit green chillies into two. Cut the red chillies into two. In a kadai (preferably non-stick kadai) put the keerai along with turmeric and pepper powder and dry fry (no need to add oil) keeping the stove in medium flame till the water content is fully absorbed and the greens are cooked. In another kadai put the oil and when it is hot add garlic pearls and fry for a while. Add chopped onions, green and red chillies and fry for few minutes. Add tomato pieces and fry well. Then add cooked pea nuts, greens along with salt. Mix everything well. Keep it in low flame and fry for few more seconds. 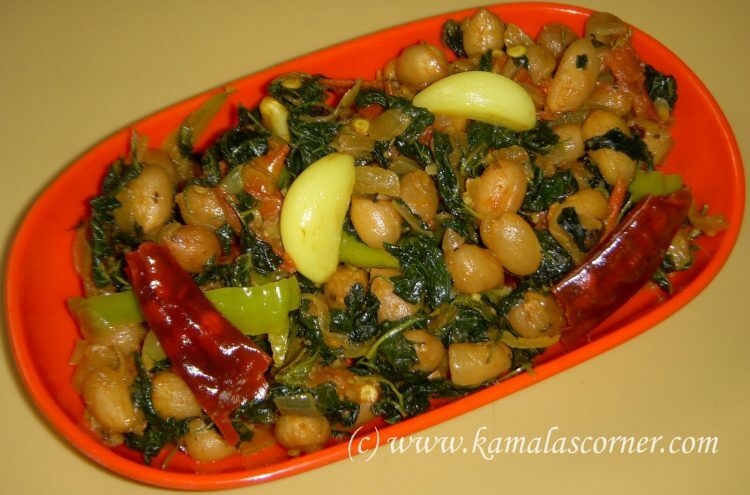 This can be served as a side dish for rice or chapatti. Or put this curry in bread slices and make bread sandwiches. Tried it today…gives a very nice flavour to greens 🙂 Thanks for posting it! Thank you for your feedback Sonum. Tried this dish. It is nice for a change from the routine. Had never used boiled peanuts in a dish. This was my first. Liked it with chappatis. Look forward to trying more dishes from your website. Thank you Tasneem for your feed back.